Soak the gelatin in a small bowl filled with cold water and let it stand there until softened, ten minutes circa. Whip up the cream into a bowl and put it in the fridge. Put the yogurt in another bowl and mix it with the honey. In a saucepan, warm the milk, remove it from the heat, squeeze the gelatin and stir it with the milk. When it starts to thicken blend it with the yogurt. Put the mixture in a pudding mould and refrigerate it for at least six hours. To prepare the sauce, cook the raspberry over medium heat with the sugar until juice is released. Leave it over the heat until it becomes dense and drier. 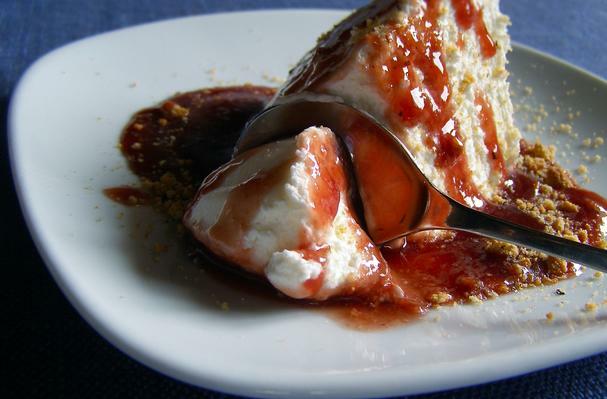 To serve the dessert, cut a slice of mousse, pour the sauce over it and, if you like it, add the crumbled amaretti on. I decide to share this recipe with you because this is the first dessert that my Grandma taught me when I was a little girl. I like to make it because it is simple, fast and easy to make, and every time I prepare and enjoy it, my Grandma comes to my mind. It's perfect to be enjoyed if you're alone and you don't have the will to prepare something heavier and complicated. It can really make you feel hugged.